Urethane Mixing Paddles – FDA Approved Mixing Paddles! Urethane mixing paddles are one of the several specialty urethane products that are manufactured at our in-house cast polyurethane facility at Plan Tech. 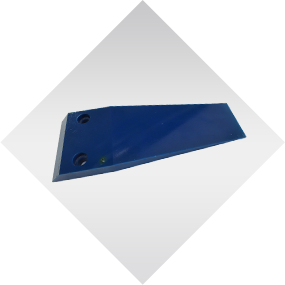 Our urethane mixing paddles are made from 100 percent polyurethane materials that offer the best quality and are produced globally recognized chemical manufacturers. Aside from the quality of the raw materials, we make use of our team of engineers who are some of the best in the cast urethane industry. They skillfully cast our urethane mixing paddles in such a way that the finished products allow for thorough mixing of the materials. It doesn’t matter what size or shape of mixing paddles you seek for your application, you can be certain of finding the ideal specification that meets your application’s requirements from our 30 plus years of designing and manufacturing polyurethane mixing paddles. One of the standout features that have made our rubber mixing paddles the go-to mixer paddle is their offering of great value for money. With our urethane mixing paddles, you are assured of products that offer exceptional physical properties such as excellent wear resistance and remarkable service life saving costly downtime in your production facility. Our rubber mixing paddles are capable of retaining their optimal efficiency even after several years of usage. And the best part is that they are fairly affordable. Plan Tech also has an outstanding team of dedicated employees with exceptional talents designing and manufacturing urethane molded parts. We also are very proud of the “company we keep.” Our customers include many Fortune 500 companies, most of whom have been customers for 20+ years. Their drive to become industry leaders has helped us do the same. For over 30 years we have focused on using speed and precision to manufacture the highest quality industrial cast urethane parts to our customers. A particular strength is the breadth of our in-house capabilities such as urethane compression molding and grinding urethane parts which, when combined with our extensive experience, enables us to deliver tight tolerance custom urethane parts while maintaining the quality control and cost effectiveness our customers require. Are you interested in cast Urethane Mixing Paddles? Please Contact us so we can help solve your requirements and work with you on your specific application!